Luminos eyepieces, EdgeHD on CPC and new camera - NightScape CCD were announced on Celestron website. The NightScape cameras is equipped with Kodak KAI-10100 (PDF), and is priced at Adorama at 1500 USD. SBIG STX camera announced with this CCD is priced at Optcorp at ~6000 USD (nice difference!). Color KAI-10100 has QE max at 45% (low in general), 4.75 x 4.75 micrometer pixels, and 25,000 e- pixel full well depth. Sensor imaging region is 17.86 mm x 13.49 mm. So we get 10,7 mpix sensor. It support few binning modes to get good resolution at higher focal lengths – at the expense of image pixel count. The camera seems to be targeted for use with EdgeHD scopes - with Optec Lupus reducer it will fit in the 22 mm imaging circle, as well with Hyperstar it will work nicely (low pixel giving better resolution). But that is very expensive scope and add-ons - in Europie it's just insane to buy big EdgeHD just to do images with the reducer or with Hyperstar (where standard SCT will do as good). There are better options for this camera - like small APOs - cheaper ! lighter, easier. In Europe QHY cameras such as color APS-C QHY8 have strong position. 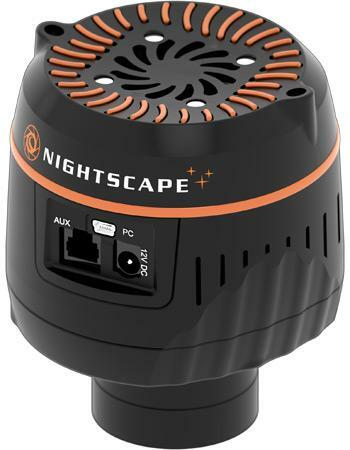 Compared to NightScape they will be bit cheaper or similar priced while providing bigger sensor with bigger pixels and also better other specs. Those cameras however work better on moderate focal lengths like for example imaging Newtonians, semi sized ED/APOs.